When Mimi came home from school on her first day, she gleefully announced that I had homework to do and handed me a sheet of paper. 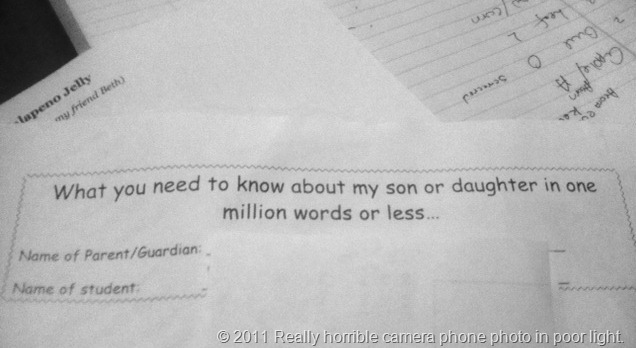 It was titled “What you need to know about my son or daughter in one million words or less…” The rest of the paper was blank…apparently I was to fill it up with my slightly less than a million words. Only…I wasn’t so keen to fill it up. I reminded my child that I had written a small book for this class last year and asked why we couldn’t just use that one. My scandalous proposal was met with a huge sigh and The Eye-Roll that every parent of a teenager is well accustomed to. My suggestion that it was her father’s turn to write about her was met with yet another sigh of exasperation. Finally, I agreed to do it…but later. I could feel the quiet desperation building up as she gently asked me every day if I had “done my homework” yet. To give Mimi full credit, she was really good about not nagging me. I had told her that I was trying to think of what to write. It was true. I was playing with the idea of writing a story about how very special our girl is. It would start with when she was still in the womb making her opinions quite clear with her elbows and heels. Of course it would carry on with how true she really is to the stereotype of fiery redheads. It would probably end with her trying to get me to fill out an informational paper for one of her classes. So, here it is…nearly midnight on the night before she needs to turn her paper in. I had every intention of writing as close to a million words as I possibly could to her teacher letting her know all she needed to about our girl. This entry was posted in It's all about me!, Mimi, Teens and tagged Homework, Spanish Class, teenagers. Bookmark the permalink. Just because I want to remember what I wrote, I’m adding it here. I will try not to edit it as I can’t really edit the pen and paper version I’ll hand to Mimi in the morning. Despite the fact that she is “almost 18” and feels grown up, we still call her Mimi — a name she gave herself (with a little help) when she was about three. I hope that someday she will realize the uniquenesss of that name and go back to that childhood name. The most important thing you need to know about her is that we adore her. Our Mimi can be trying at times. She’s stubborn, opinionated and a bit of a know-it-all. She has a nasty habit of leaving her clothes flung around and putting things off until the last possible minute. (Hmmm…wonder where she got that?) I’m sure that I could ramble on forever about the negative quirks that she, like all of us, has. It’s the good, wonderful…special things that endear her to us. Mimi is one of the kindest, most compassionate people you will ever have the honor to know. She may seem shy and a bit off-putting until you get to know her. Once she lets you in, you will find a passionate, funny amazing girl. Nearly everyone adores her although she doesn’t always realize it. She has always had that effect on people since she was tiny. I can only hope that you get to see the “real” Mimi. That’s wonderful and I’m glad you memorialized it here; I love when a teacher wants to know a student like that.